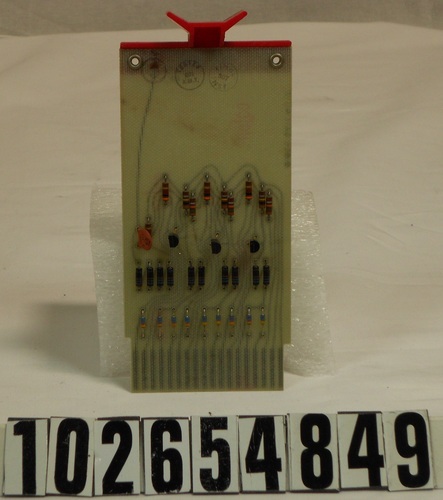 The object consists of one S111 module with a green board and a red plastic extraction handle attached by two rivets. The handle reads "DIGITAL EQUIPMENT CORPORATION MAYNARD, MASSACHUSETTS" in raised letters on the solder side. The board on the solder side reads "DIODE GATE R111D" along the left edge. There are three circular black inspection stamps on the component side. A very faint repeating pattern that reads "neLco" is printed on the board in red.